In 2018, current CEO James Napier, being a knee down amputee, was determined not to let that disability affect him. James reached out to a friend, fellow patriot, serial entrepreneur, and current COO Lance Wood. Together, while eating some special hot sauces at a local barbecue, James thought that he could sell these hot sauces. In collaboration with their wives, where everybody brought a certain skill set to the table, The Patriot Brands LLC was launched shortly afterward, selling 12 hot sauces. Just two weeks later, requests were coming in for similar specially designed labels. Quickly, the branding side of the company was added with an in house graphic design to sell labels at a fraction of the cost. Eventually, an in-house fulfillment center was added to further reduce costs. James then resurrected his dream of selling jerky. Being a local mom and pop shop with great capacity as a full service meat processor, James had secretly been working on perfecting some jerky flavors. Teaming up with trusted FDA certified processor Kill to Grill with their decades of experience manufacturing jerky, this The Patriot Brands Jerky was officially launched, and sold to the USA, Australia, Ireland, Britain and the United Kingdom. This jerky is distributed by The Patriot Brands LLC, and they are located in Cuba, Missouri. 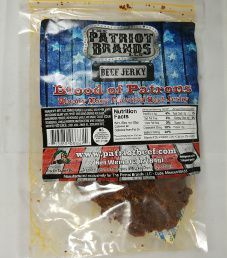 The next review on The Patriot Brands Jerky will focus on a 3 ounce/84 gram bag of their Blood of Patrons flavored beef jerky. This flavor is described as to think of a Bloody Mary drink only with beef, containing celery salt, garlic flavor, and some horseradish finish. The bag was graciously submitted for review by COO Lance Wood. Ingredients: Beef, Tomato Powder, Dextrose, Red Pepper, Whole and Ground Celery Seed, Spices (Including Ground Mustard), Horseradish Powder, Dehydrated Garlic and Onion, Sugar, Sodium Bicarbonate, Vinegar Powder ( Maltodextrin, White Vinegar,Modified Food Starch), Citric Acid, Lemon Oil, Sodium Nitrite. There is no liquid marinade used here other than a little amount of healthy lemon oil. Some people would call this a dry rub or old fashioned jerky. 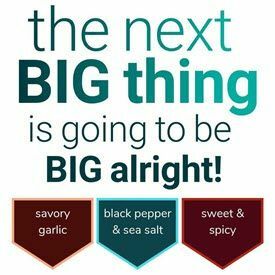 Some healthy ingredients are added such as garlic powder, onion powder, tomato powder, celery seed, celery seed powder, horseradish powder, spices, and mustard powder. Horseradish is known to offer many health benefits such as helping prevent cancer, lowering blood pressure, improves digestion, and acts as a antibacterial agent, among other things. The sugar level is great at only 1 gram of sugar per 28 grams of jerky. The salt level is high at 550mg of salt per 28 grams of jerky to lose a rating. Our preference is 350mg of salt or less per 28 grams of jerky. This jerky does not qualify to have no sodium nitrite added, as sodium nitrite is used outright to lose another rating. Admirably, this jerky qualifies to have no MSG added. 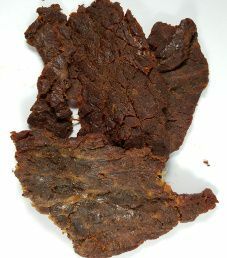 These strips of jerky are medium in size, and sliced to a medium thickness. The texture as advertised is fairly soft and tender, being easy to chew. Handling this jerky leaves a slight oily residue on your fingers. The aroma is of celery and tomato, which very much piques your interest. Wow, this Blood of Patrons flavor does not make any excuses, you are immediately met with a moderate level of celery flavor. Other flavors that start to take notice are a mild level of saltiness, and the wonderful combination of garlic/onion. As expected, there is a decent level of tomato flavor that imitates tomato or clamato juice, and of course tastes great. What puts this flavor over the top is the spiciness and flavor from the distinct unmistakable tasting horseradish. On a heat scale the spiciness may only rate a 2 out of 5, but is positively noticeable beyond a shadow of a doubt. As an added bonus after consuming several strips, you get a wicked aftertaste of the horseradish that lasts about 30 minutes. There is barely any sweetness present, allowing a good level of natural beef flavor to shine through. Paul, who is a huge fan of Blood Mary’s to begin with, was equally enthusiastic about this Blood of Patrons flavor to say: “I don’t normally enjoy soft and chewy, but this flavor is ‘wowing’ the heck out of me. I am met with a myriad of delectable flavors. The jerky is practically melting In my mouth. I detect a fair amount of natural beef as well. I am very enthusiastically rating this flavor a 20/10. Color me duly impressed, this flavor is seducing me like a brothel of virgins pining to no longer be unsullied. As Wayne & Garth would say from ‘Wayne’s World’, SCHWINGGGG!!!!!! Some words that come to mind describing the ingredients used here are ingenious, creative, unique, imaginative, and clever, not to mention being delicious tasting. For any fans of a Bloody Mary, this is a must try flavor, where Patriot Brands knocks it out of the park here. Take a well-deserved bow here Patriot Brands, admirably they managed to capture the essence of a Bloody Mary drink, just with beef instead. A 3 ounce/85 gram bags sells online for $7.99. That works out to $2.66 an ounce, which rates as a borderline average price. The majority of bag categories are covered here. Missing is a blurb printed about The Patriot Brands Jerky and this Blood of Patrons flavor, Also missing is a best before date, but a sticker on the back is likely the batch number, which could translate to a best before date.